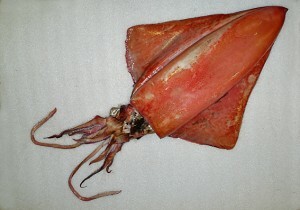 The Diamondback Squid is instantly recognisable by its large size, bright red colouration and distinctive, angular shape (echoed in the specific name ‘rhombus’). The main body can reach 1 metre and with tentacle length combined, the entire animal may be up to 2 metres in overall length. These impressive squid often travel in pairs or small groups, to depths of 50 metres or more, but frequenting surface waters at night to feed – at which time they are often seen by fishermen. Like other squid species, the suckers are each equipped with a ring of ‘teeth’ which strengthen grip on fish prey. Diamondback Squid are fished commercially in certain parts of SE Asia. In 2010, the Queensland Museum acquired a large and very impressive specimen of this species collected in Moreton Bay in only 1m by a local angler. Almost cosmopolitan: Australia-wide but sporadic.